Best AI we have ever stayed in, in the Caribbean or anywhere else for that matter. We were allocated a Junior Superior suite in villa 4, actually the same room as we had been given on a very short visit several years previously. There are 8 rooms in each villa, 4 on the 1st floor. 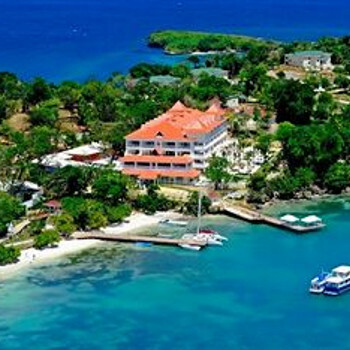 Huge, quiet room with an enormous balcony overlooking a quiet beach and a full view of Samana Bay. Actually saw dolphins from the balcony in the early morning and I suspect that you would be able to see the famous humpback whales from there if you visited during the early months of the year. Kept extremely clean with fresh towels twice per day. Food and drink were top notch - top shelf spirits readily available. Ate mostly in the main buffet as the food was so good, especially Chinese, Mexican and Gala nights but our one visit to an a la carte didn't disappoint(other than small gourmet servings). Entertainment is very low key -not a priority for most visitors although the entertainment staff try hard to get people involved without pressurising. Beaches and pools very clean, sun beds plentiful, plenty of shade and no problems with beach towel availability. Service everywhere is absolutely fabulous -nothing is too much trouble and they have an outstanding Customer Services manager, Alexis, who didn't appear to sleep!! Last but not least the stunning surroundings -set in its own grounds it’s the only hotel on the small island -fantastic landscaped gardens everywhere and great views from multiple points on the island. Travelled July/August 2012 with Thomson/First Choice. The hotel is set on its own 'private' island just a 10 minute boat ride from Samana. The island has it's own private beach (in two parts one very calm and the other known as the 'windy' side which is very welcome). There is also a public beach known as 'Bacardi Island' as this is were the Bacardi advert from the 1970's/80's was filmed, this is accessible from the hotel grounds for residents, however, your all inclusive is not valid here during the day, only of an evening when the hotel takes over the bar area for beach parties, however, these are not well visited as the resort is not really geared to the party crowd. The hotel management are very hands on and you will see them throughout every day walking the hotel and grounds checking all is OK both with the resort and its guests - something I've never seen before. Staff are just fabulous and huge credit to the hotel, food is delicious, they have a themed buffet every evening, along with three A la Carte restaurants that you have to book in advance for. Lobster is available with alarming regularity, along with smoked salmon, caviar and Cava for breakfast. I honestly believe that they have covered catering for even the pickiest of eaters, in short honestly if there's something you really want they'll do their utmost to ensure you have it. There is nowhere at the hotel/resort that isn't taken care of with regard to upkeep and cleanliness. Rooms are located in the main hotel and in villas dotted around the island, the island is quite hilly however if you don't/can't do the walks and you are in a villa, just call reception and they will send a buggy to collect you. All the rooms are very large with four poster beds, TV, coffee/tea, mini bar, bathrooms with separate loo, and shower, twin wash basins and a spa bath. The hotel does put on entertainment, I understand it's not the best, but entertainment is not on my list of requirements when looking at holidays, so I really can't comment. The ONLY downside to this resort the is transfer provided by Thomson/First Choice, they no longer fly into Samana airport which is a 1 hour transfer, instead everyone flies into Puerto Plata and then you get to do a 3-4 hour transfer, on our arrival this actually took 5 hours due to problems with the coach its was quite clapped out to be polite, the return journey was is a much more modern coach and took 3.5 hours. Grand Bahia Principe Cayo Levantado is their flagship resort. Standard in the package that are extras at other Bahia resorts are things like room safe, 24 hour room service, unlimited a-la-cart, internet access with Wi-Fi and branded spirits. If you know the Bahia resorts already, it's as if the whole resort is a Golden Club/Don Pablo upgrade. There are 194 rooms in total which makes any early morning rush to grab a sun lounger unnecessary. The best rooms to go for are the superior junior suites which are located in villas dotted around the island. The mini-bar is topped up daily with two beers, Pepsi, 7Up and Fanta along with miniature whisky, vodka and Bacardi. The food is up to normal Bahia standard which is pretty good, but no better than other Bahias. The service and friendliness of the staff is excellent - same as the other four Bahia's I've been to. The lobby bar is tiny compared to other Bahias, eight stools fill it up and only once did I see it fully occupied in two weeks. There are bars located by each pool, one on the beach but the lack of any swim up bars is noticed if you have used them in the past in other resorts. If you want any nightlife this resort is not for you - hardly anyone is around much after 10pm (when the show finishes). The lobby bar closes at 11pm and then transfers to the public beach bar until 2am but on most nights there were at most four people there. Travelled to this hotel for two days(one night) when we accepted an offer whilst staying at the GBP Punta Cana. We were paid $200 in cash,free transfers,an upgrade when we went back to Punta Cana and a free whale watching trip was thrown in. This was because of the well publicised overbooking incidents at GBP Punta Cana. Checked out of Punta Cana at 7:30am , leaving luggage we didn't need in their secured(?) storage area; first problem was no coach!Checked with Guest Services at 8:00am who first of all, told us not leaving til 9:15, then told us had gone at 7:00am - finally found out that the coach was waiting for us at the main entrance to the hotel as it had left from the Bavaro side of the complex at 7:30am.Was rushed over by porter to be slow handclapped by other(ignorant) guests already on the coach.Thanks very much Guest Services(Junior) for giving us the wrong information!! Then followed a fairly hairy 4 hour coach trip through very varied scenery including crossing the hills on dirt roads - something I hadn't experienced on a coach before! Once we reached the harbour on Samana we were transferred to a speed boat for an exhillerating ride out to (and around) the island of Cayo Levantado.The hotel makes a very impressive sight as you approach. Check in went smoothly and we were allocated a room in one of the seperate villas scattered around the grounds -room 4102.Only downside is that these villas are spread out over the hillside so if you have difficulties walking, probably need to wait for the little train which travels round the site in a circle. Absolutely magnificent suite, huge bathroom with seperate shower room,jacuzzi tub,huge 4 poster bed - enormous well equipped balcony,totally secluded, looking out through the trees to the sea! After changing we went back to the main areas for an excellent buffet lunch before departing on a whale watching trip out in the Bay of Samana. Quite rough seas -a few people violently sea sick - but well worth it as we saw several females with their calves swimming on top and got some good photos and video.Local guide spoke excellent English(French, Italian....)and filled the trip in with lots of interesting info on the whales. Returned to the hotel and spent the rest of the afternoon by a magnificent pool at the top of the site - very quiet - extremely well equipped with both standard sunbeds/shades and 4 poster sunbeds!Set in absolutely stunning grounds with a view of the "mountains"
Ate at the buffet that evening - food was extremely good- and then had a few drinks in the cool and airy main bar before retiring for the night. Up early the next morning to take advantage of the fab surroundings.After breakfast we sat on the beach on our own for about an hour! watching the whales about 0.5 miles out to sea leaping and waving huge tails in the air! a really magical sight. The hotel has two short sections of its own beach backing on to a large swimming pool; the perfect place to chill out. There is a lift from this bottom pool back up to the top for access to the villas on the high ground and the other quiet pool. On the island there is also a public section with its own beach which looked very nice from the speedboat.This area is completely isolated from the hotel however. In conclusion, we wished we could have spent the rest of the 2 weeks there - it truly is a 5 star resort.